Some films have an air flow release liner making installations much easier by allowing trapped air between the glass and film channels to escape thus removing wrinkles and bubbles. Low tack pressure sensitive adhesive bonds well and removes cleanly and can be re-positionable. Installations can be done by company employees’ making this an ideal preferred method for saving time and money otherwise spent on installers. 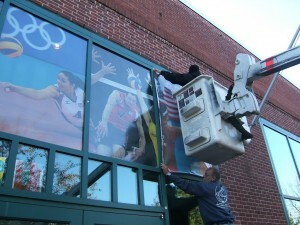 Adhesive films and specially formulated durable calendared vinyls with permanent adhesive makes these films the best choice when a more long-term permanent graphic is desired. We work with the best certified, trained and bonded installers nationwide and our project managers will coordinate all of it for you.